The ideas behind Tivoli's latest DAB radio are simple: access to wonderful sounding DAB radio and nothing else. Except that you can attach an iPod and carry the diminutive unit in your suitcase. Impressive, but for over £200 this had better be a top-class performer. It's not. Tivoli do make some interesting DAB products that have impressed us recently, most of which are notably low on features, but high on sound quality and, like a certain Belgian lager, reassuringly expensive. And like Stella Artois, the Songbook 100 leaves a bad taste in the mouth that's largely to do with that high price tag. You'll find no add-on features on the Songbook 100. No seven-day electronic programme guides for BBC stations and no ability to record onto removable media. It's part of a general industry trend that's seeing many DAB radios cutting-out features that no-one actually uses - not necessarily a bad thing. Tivoli has designed its Songbook 100 for music fans, especially owners of iPods. Digital radio is a wonderful thing - all those stations in crystal clear quality - but we have to admit that the ability to attach an iPod, or similar, is an attractive feature. But the Songbook 100 is simply equipped with a basic analogue audio in, so absolutely anything can be attached. The ins and outs are hidden by small rubber caps, as if it's some kind of sports radio. Unfortunately, this design touch jars with a sleek black finish that's begging for fingerprints, although it's also available in bronze and silver. That said, the Songbook 100 is clearly well made and feels almost unbreakable - there shouldn't be any trouble slinging this in a suitcase now and again. Buttons on the unit's gloss black front are numerous, tiny, and fiddly to use. Combined with a paltry amount of preset stations - just five each for DAB and FM - the blue backlit LCD featuring two lines of text sit above a set of controls. Again, these are small, but easily touch sensitive. Two small dials are provided: one to control volume, the other to switch between DAB, FM (which has access to the RDS information), the auxiliary input and the unit's power. If operating the Songbook 100 is a little fiddly, sound quality is fair from the single speaker. Considering its tiny size there's a reasonable performance from both voice and music, but nothing that suggests that this is a £200 product. 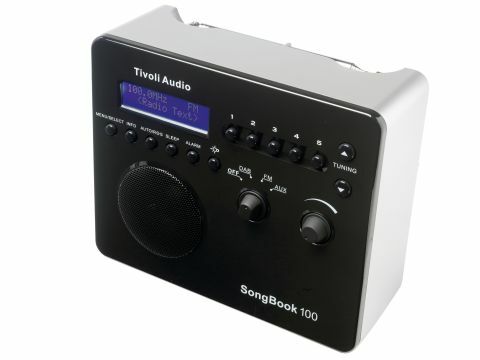 Portable if used with six AA batteries, the Songbook 100 might suit a frequent traveller, but limited features and sound make this Tivoli a miss-hit radio.